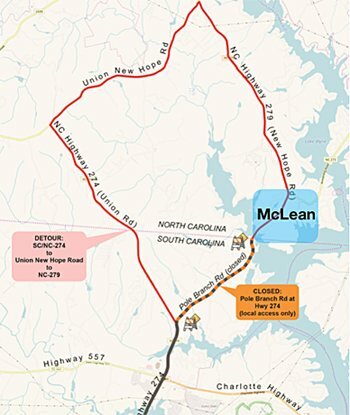 McLean’s main road into South Carolina, Pole Branch Road, will close Nov. 30 to Dec. 3 for road improvements. Pole Branch Road will remain open to local traffic only. York County, SC, is spending $35 million to transform two-lane Pole Branch Road into a three- to five-lane highway from the NC state line to just north of SC 49. Construction began last May. Once completed in 2020, the vastly improved roadway will make it much easier and safer for McLean residents to reach the Publix supermarket and many other businesses in Clover and Lake Wylie, SC. 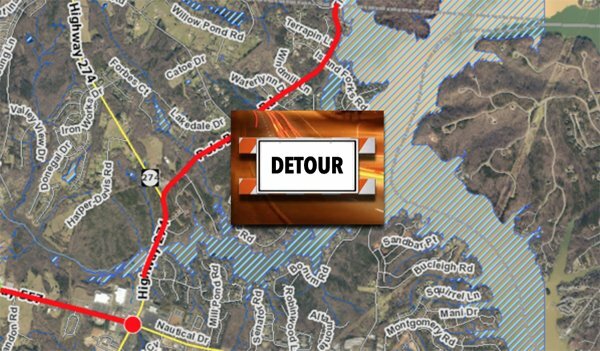 The detour from McLean into South Carolina will require taking New Hope Road (NC Hwy 279) north to Union New Hope Road, then southwest on Union New Hope Road to Union Road (NC Hwy. 274). Continue southeast on Union Road into South Carolina on SC Hwy. 274.